Known also as “Lord of the Flame” or “Fire-Father”, Pramath is one of the oldest of Samshara’s primal deities. Said to have created the Human race from a single spark, most humans worship him as their creator, and burn small symbolic offerings at his altars. Most of his devotees paint their bodies with ash to symbolize his cleansing energy. Volcanic ash in particular is a prized and holy substance used in special rituals. Pramath is said to be an enormous fiery being who walks with a staff of volcanic rock. On his shoulder he is accompanied by a massive eagle named Kvakka, who acts as his messenger and companion. 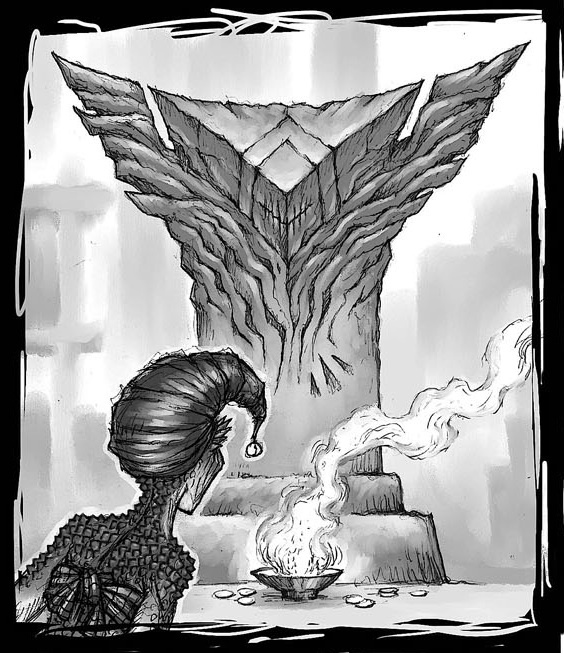 Kvakka is also bestowed with the power to control flame, and his image is often used as a good luck charm. It is said that Pramath is the creator of all fire spirits, including the powerful Ifrit, who are renowned for their quick temper and destructive abilities. True adherents to the way of Pramath are some of the only mortals capable of calming and communicating with the volatile fire spirits. Pramath’s way is one of cleansing and renewal. He also prizes adaptation, ingenuity and independent thought, teaching his followers to solve their problems with creative solutions rather than brute force.